There are a number of different athletics facilities which we can install for schools, clubs and leisure centres across the UK. 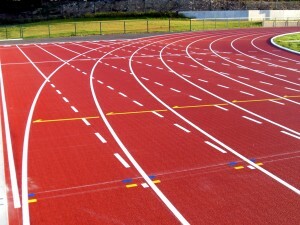 As experienced athletics track specialists, our team have worked on a variety of installation and maintenance projects for both recreational and professional tracks. Below is some more information on the different surfaces and facilities we have available. If you have any questions about the services we offer please feel free to contact our team for more details. We’d be happy to give you some product sheets and case studies of our previous work. Just fill in the contact form and let us know what you’re looking for so we can get back to you with some professional advice. Polymeric Rubber Surfacing – This surface type is traditionally installed for professional athletics clubs and for competitive events. The polymeric track surface is made up of EPDM rubber granules which are mixed together with a binder and poured out onto a macadam base. Polymeric surfacing can be installed in a range of depths and area sizes to fit with the individual specification of each project. The rubber flooring specification can come in a number of colours including red and blue so you can create a bespoke design. It is ideal for competitions and training for a variety of running and jumping events. Feel free to contact our team for more information on the costs for installing this kind of facility. Needlepunch Synthetic Turf – This fibre bonded artificial grass surface type is extremely durable and long lasting and can be installed in a variety of bright colours and stripe designs. A layer of sand infill is installed within the woven turf carpet to keep the fibres upright and enhance the performance qualities. Many primary schools in the UK choose to have the needlepunch surfacing installed as it creates a softer landing surface to protect young kids from trips and falls whilst using the athletics facility. We can also apply line markings for both of these surface types to distinguish between separate numbered lanes and to enable accurate scoring for races and competitive events as well as for training with different sports. These can be applied in different colours as well to ensure they are clear to see. 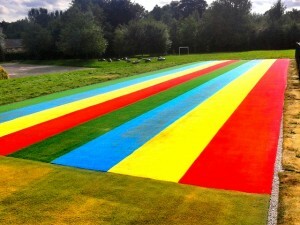 The long jump runway surfacing can be installed in the same surface types as athletics running tracks – polymeric rubber or needlepunch synthetic turf. This kind of facility will usually feature a run up track with a sand pit at the end. The athlete will run along the track up to a marked out line and then jump into the pit. We can install these runways in a variety of sizes to suit your budget and existing outdoor space. The triple jump runways we install will usually be similar to the long jump tracks and made from the same surfaces. Many organisations choose to have a muti use facility which can be used for both long jump and triple jump activities. We are also able to fit multi lane and dual purpose areas which have a full run up and a practise run up on different sides of the sand pit. This is perfect for using the space efficiently and helps to cut costs as you won’t need to have multiple landing pits installed. 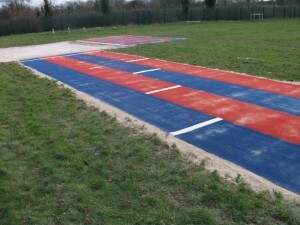 We also install the sand landing pits for these athletics facilities in a number of sizes and specifications. The sand pit is extremely important as it allows accurate jump scores to be taken and also gives a safe area for the athlete to land once they have completed their jump. These can also be customised to fit within a particular space, to make sure you’ve got the perfect facility. Needlepunch artificial turf and polymeric EPDM rubber are also the primary surface types that are used in the high jump services we carry out. These surface specifications provide great grip and traction for high jump events, therefore creating good performance characteristics for high jump athletes during training and competitions. The overall designs and specifications can be altered to suit your budget, and we can be very flexible on the construction process. Many schools and clubs choose to have these high jump fans constructed, and there are many designs that we can offer. For schools and recreational facilities we would recommend the Multisport needlepunch surfacing as this offers a softer feel and is generally better suited to children. If you are looking to install a surface for competitive events or club level training, the polymeric rubber flooring would be the best option as this offers professional standards. Please let us know if you would like some more information on either of these specifications. One of our experts will get back to you as soon as possible with any product sheets or case studies you need. We offer a number of professional maintenance services to help look after athletics tracks and facilities in a wide range of specifications. The maintenance we carry out could include pressure washing for polymeric surfaces, rejuvenation of sand infill for needlepunch synthetic turf, removal of dirt and debris from sand landing pits. We can also provide extra equipment to help you keep your athletics facility free from damage, including sand pit rakes and covers. 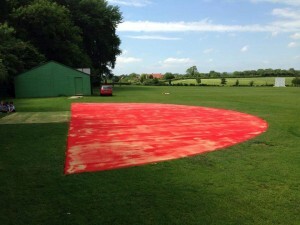 Click here to find out more information on maintenance of athletics facilities and what you can do to keep the surface in top condition – https://www.sportsandsafetysurfaces.co.uk/athletics/athletics-track/repairs/ shows you all the ongoing repairs and maintenance of athletics facilities. If you’d like any further information about the athletics facilities we install, take a look through the pages on the ‘athletics’ tab to find what you’re looking for. You can also send us an enquiry through filling in our contact form with as much detail as possible about your project. One of our experienced staff members will be happy to get back to you with some helpful advice in regards to costs and specifications.